The soft pad Aero-Deck® chair, designed by Scott Howard in 2016, combines the best of current design features with classical styling. 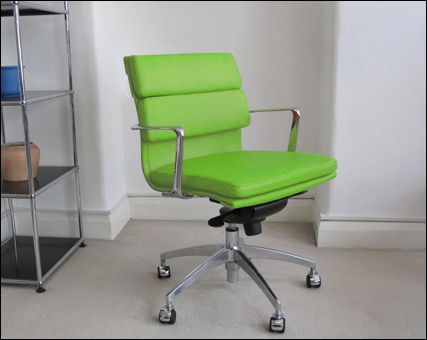 The chair comes as standard with a five star aluminium base on wheeles. 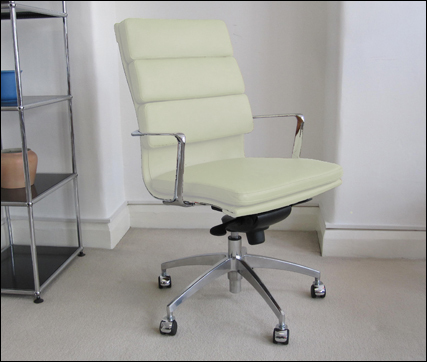 Alternatively, we can offer a chromed base for the same price. 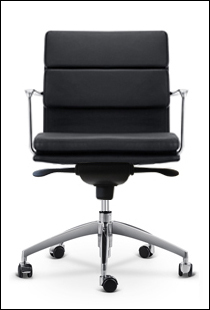 The soft pad Aero-Deck® chair is fitted with a knee tilt mechanism, as standard, which offers the user a tilt facility which is lockable in any position throughout its travel. 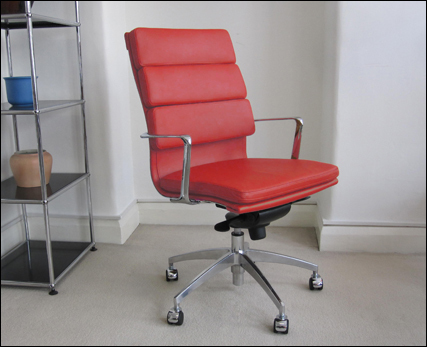 The chair has chromed double wheel castors, pneumatic height adjustment, ergonomic tilt and comes in a choice of nine standard leather colours. 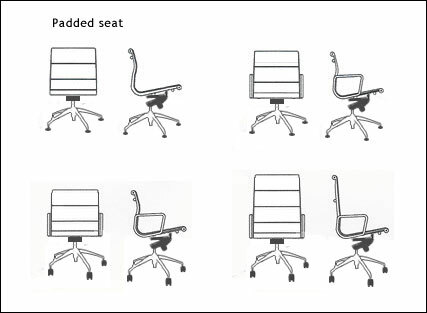 Soft pad Aero-Deck® chairs are ideal for use in a variety of applications, such as conference chairs, office chairs and comfortable chairs for waiting areas. 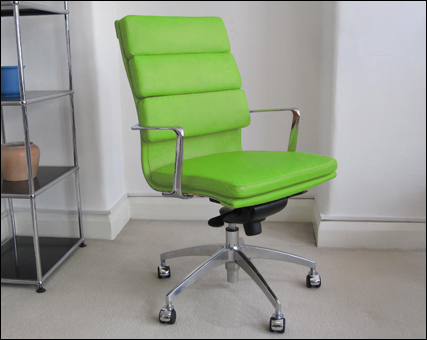 The Aero-Deck chair comes with wheels as standard. 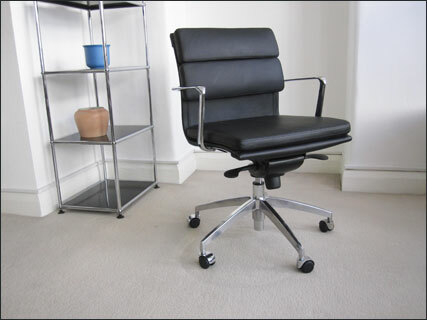 Aero-Deck® low backed soft pad desk chair with arms. Height adjustment and tilt facility. Aluminium five star base with castors. 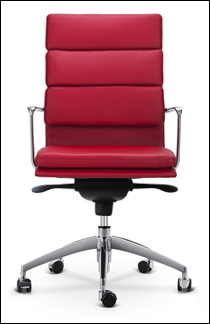 Aero-Deck® high backed soft pad desk chair with arms. Height adjustment and tilt facility. Aluminium five star base with castors. 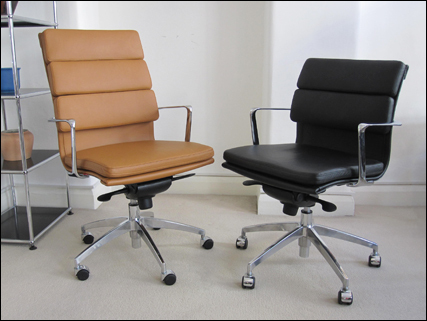 All leathers are available in a wide range of colours. Please contact us to discuss your requirements. 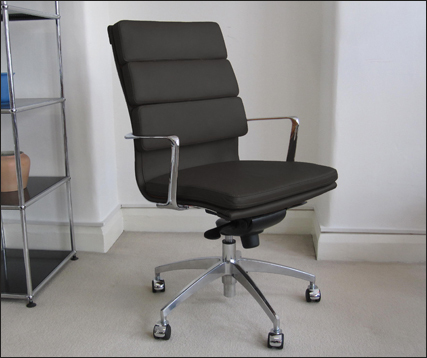 The soft pad Aero-Deck® chair is an original design, manufactured and distributed worldwide by Scott Howard. 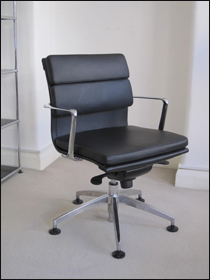 The term Aero-Deck® is a registered trademark of Scott Howard Office Furniture Ltd.
Customers often ask us if our leather is genuine leather. 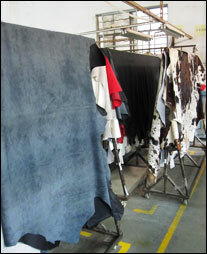 Here we show racks of hides ready to be cut to size for use on our chairs. We do not use aniline.